INNOCENT VICTIM: The mallard drake picked up in Shropshire with the serrated can stuck around its lower beak and tongue. The bird would have starved to death had it not been found as it was unable to feed and drink. Picture courtesy of the RSPCA. NEEDLESS SUFFERING: An RSPCA inspector shows the adult bird in its original distressed state. Picture courtesy of the RSPCA. 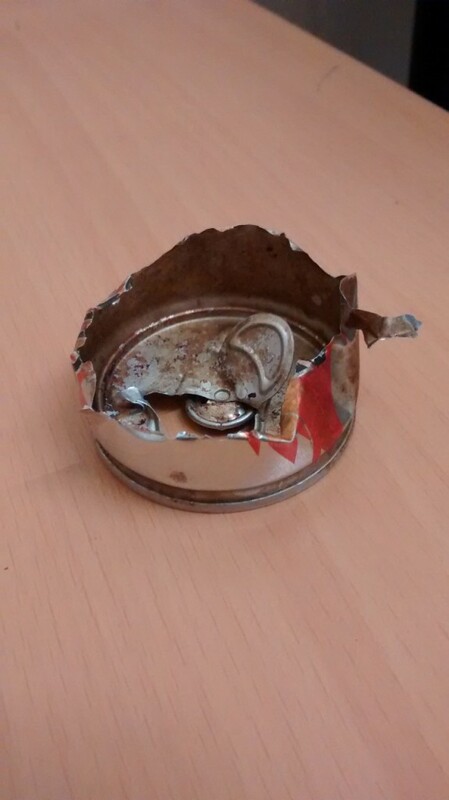 SHARP OBJECT: This is the serrated can after it was extracted from the mallard drake. Picture courtesy of the RSPCA. TRAILER TRASH: I found this trailer was placed for rubbish by the Lulworth Estate at Durdle Door on my most recent visit there. I subsequently found out one of the reasons for this was when nearly two years ago half a ton of rubbish was dumped on the iconic beauty spot over the course of two weeks and was eventually cleared. 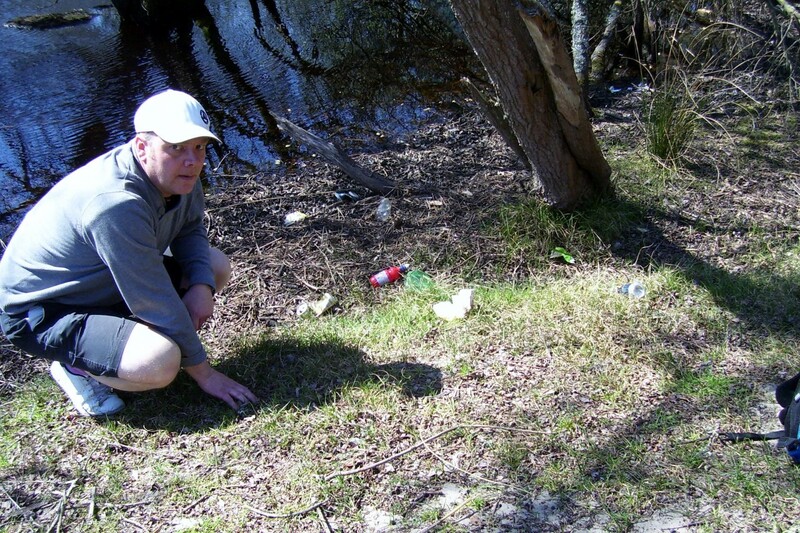 LITTER LEGACY: I am pictured with some cans and bottles left near the river that runs through the southern end of the Studland Nature Reserve, leading down from the inland lake. WHEN we throw litter or rubbish out of cars or out walking because we can’t be bothered to find a bin, if is often the wildlife that pays the price. Many times when I’m out and about in east Dorset to and from work or visiting places, we see items fly-tipped in lay-bys or tins and soft drinks cans or bottles, cigarette packets and food packaging left on the pavement. I have seen this in the Holes Bay area of Poole, Parkstone Bay, Branksome and Boscombe as well as more flagship tourist areas like Sandbanks, Studland, Corfe Castle and Tolpuddle. When I visited Lulworth Cove and Durdle Dor with some friends a few weeks ago, I noticed a special trailer for litter to be deposited by visitors to the Dor and this was provided by the Lulworth Estate. Back in August 2013 it was reported in a local newspaper that half a tonne of rubbish was collected over two weekends Durdle Door and this included 50 burnt out barbecues, nappies, polystyrene containers, plastic bottles, and the remains of picnics and food. The image being used in this update has been supplied by RSPCA press officer Sara Howlett and although this incident occurred in Shropshire, this could have easily been in Weymouth, Somerton, Cranborne or Bridgwater. 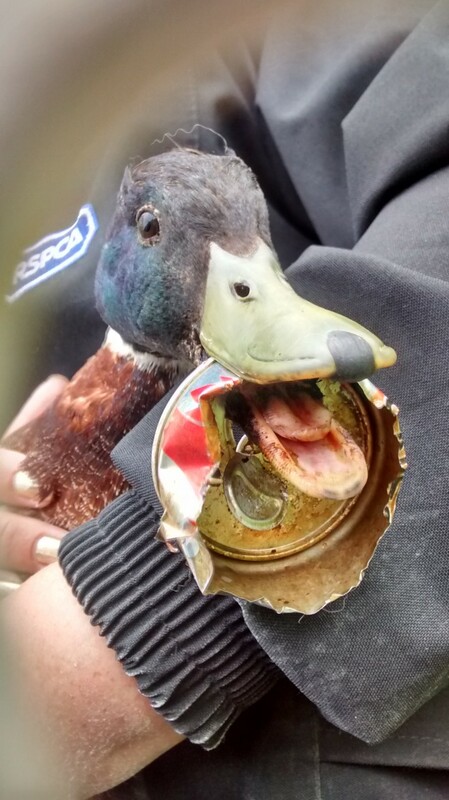 The mallard male duck was found by a member of the public with a serrated can stuck around his lower beak and tongue and this left the bird unable to feed and drink. 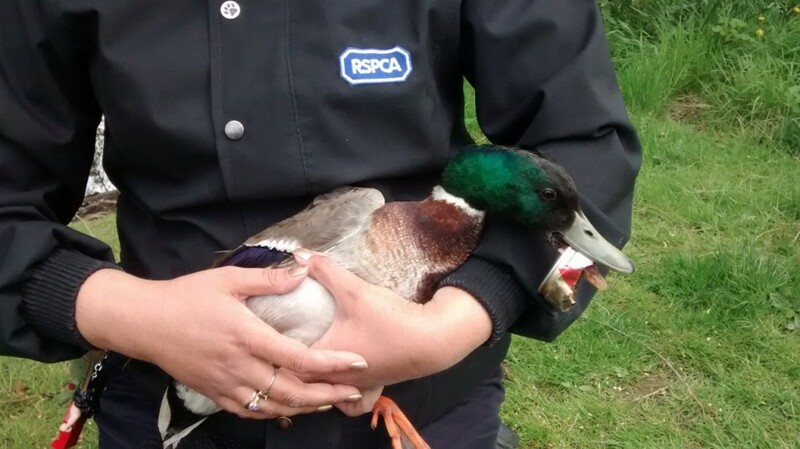 The duck was sent to a nearby wildlife rescue centre and successfully treated. RSPCA animal welfare officer Elaine Williams said: “There was a lot of blood and the wounds were deep. It was shocking to see. Thankfully we were contacted by members of the public about him otherwise he may have starved to death. “When we found him the top half of a drinks can was caught around his lower beak with the sharp edges cutting in to his tongue and beak. He must’ve been in absolute agony. Perhaps the next time we decide to be lazy and not dispose of our litter in the right way, perhaps these disturbing images may help prevent other wildlife from suffering the same fate. Doubtless there will have been other wildlife victims that will not have been so fortunate as this mallard and suffered a lingering death through suffocation, perhaps a mouse could have got stuck in a plastic bottle or a seabird may have picked up something, mistook it for something else, swallowed it and possibly died. So when you are going out to visit a beauty spot, nature reserve or are going for a walk, please think of the consequences when not discarding of rubbish in the right way. Well done, Matt, and well said. We need more awareness of just how much litter harms our environment and the creatures we are meant to care for.